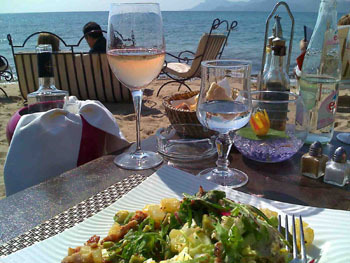 I have been a regular visitor to Antibes for the past twelve years, although I first got a glimpse back in 1961 on a family holiday. 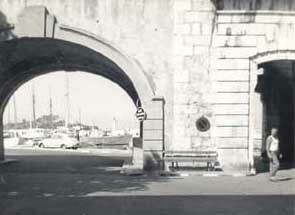 The old arch overlooking Port Vaubaun still looks like it did all those years ago. 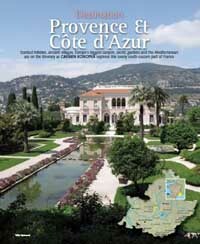 Many visitors who fly into Nice will see Antibes and all those yachts and boats as they approach the runway at Nice. If you are flying through France you will suddenly see the sea on the horizon and the plane will turn left just over Cannes and follow the coast for the remainder of the journey. 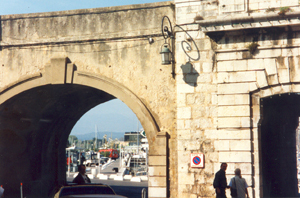 The port of course has changed and increased in size to accommodate all those "super yachts" that you can see from the historic old town walls over that arch. Some of these yachts even have their own helicopter and there are numerous companies involved in maintenance and food supplies. 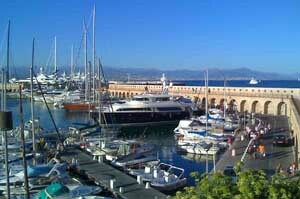 Roman Abramovich keeps one his yachts there, however the port is still not big enough for vessels that are even bigger and an extension is planned. Just outside the old town walls opposite the port is a large area of land, this has been used as car parking for many years, but had to be closed when an exhibition was being held on the site. 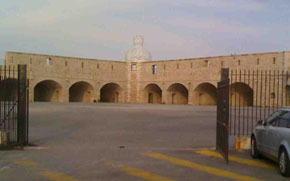 The town decided to solve the parking and exhibition problem by building a 600 place underground car park and the open land above will hold exhibitions and other events. 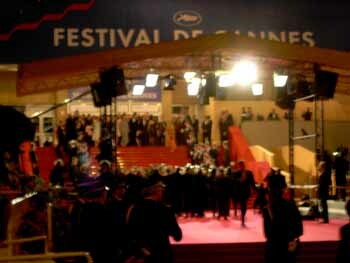 The project is due to be finished in the summer of 2013. 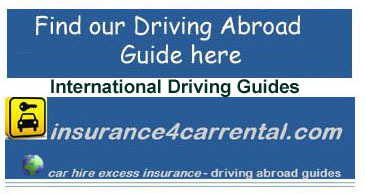 If you are visiting Antibes by car, it is best to park it. 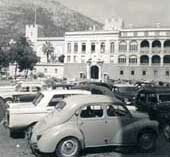 You can park in the port area, or for a really long interesting walk park in the car park opposite Fort Carre. 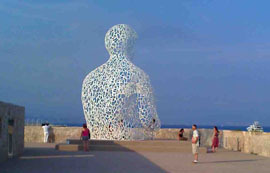 You can then see many of the yachts and visit Le Nomade sculpture by Jaume Plensa en route. 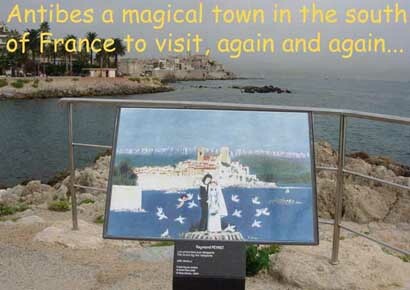 Continue that walk and visit the Musée Picasso on the right of the battlements. It is open all year except on Mondays. It is closed on New Years day, 1st May, 1st November and Christmas day and is well worth a visit. You can continue your walk along the sea front past an area where local play boules and within site of the streets of the main town of Antibes. Continue past the plage de la Salis (they have firework displays in this area on Bastille day) which is a very well maintained public beach with plenty of car parking, although can be rather busy in July and August. At the end of the beach is a picturesque harbour and opposite that a stepped walkway leading to the lighthouse (Phare de la Garoupe) area on Cap d'Antibes. You can also drive up there as it quite a climb and at the top the seafarers chapel (Nôtre Dame des Amoureux ) is well worth a visit recording the victims of drowning in the sea below. The views are magnificent day or night. 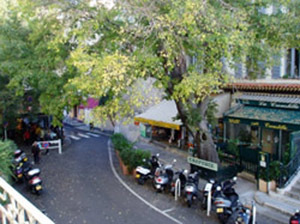 Instead of taking those stairs up, start walking around Cap d'Antibes, in the early evening it is a joggers paradise. The houses are expensive, you will also find for sale signs in three languages nowadays. French, English and Russian. At this point you might want to turn back as it is a long walk to Juan-Les-Pins and collect your car. Follow the route back past the beach and stop and take a look at the view of the old town with the odd picture in the painters trail, near the Royal Beach restaurant. Instead of walking around the walls of the old town go downhill (and up) into the old town itself. Here you will find the historic market place. This is always full of activity, from produce being sold to artworks available and tables and chairs galore from local restaurants. At one end of the market place is the Hôtel de Ville - town hall. Take one of the streets opposite and you can spend ages exploring the old town itself. Once you have down this Collect your car and drive along the ramparts past the plage de la Salis and onto the road going around Cap d'Antibes. Turn left into baie de la garoupe and if you want another walk park your car here and venture around the walking area of the Cap. It is well worth a visit. Move on and drive past the very smart Hôtel du Cap, The Oetker Collection owns the hotel now and apparently the hotel (like many others) closed for the summer until in the early 1930s the owners were persuaded to open it. Summer holidays suddenly came along. 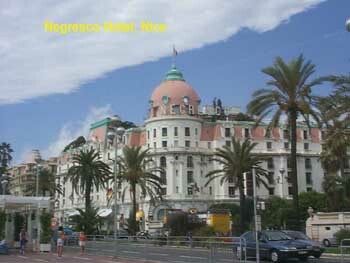 Just past this magnificent hotel you will see the Musée Naval et Napoléonien (Museum). 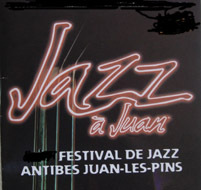 Take a few more gentle bends and ahead of you will be Juan-les-Pins. Back in the 1880's it was a quiet little fishing village and in the 1960's became a resort for the "jet set" according "Where Do You Go To (My Lovely)? ", by the singer Peter Sarstedt. 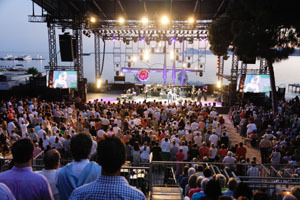 There are kilometers of beaches at Juan-les-Pins, public and private and they go on right out past Golfe-Juan on the way to Cannes.